One of the highlights for me during this Christmas period was an interesting conversation that I had with my eldest niece, Jacqueline. 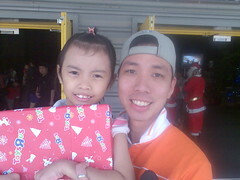 We were at the Christmas Rock event by City Harvest Children’s Church. And this unfolded towards the closing moments. “Jesus is God.” (me shrieking with glee). This exchange was going on in Mandarin and I did my best to explain with my limited vocab. Explaining the theology to a 7-year old can be really challenging. I was not even sure if I replied correctly, but those were the words that was put in my mouth to answer. Nonetheless, I thank God that my niece’s heart has been spiritually awakened. I pray that those ‘seeds’ of truth will one day bear the fruits of her salvation in Christ. We are nothing, just dust. Wow! thank God… it’s so exciting to hear this testimony… gosh, thank God for your heart for the kids too – i rmb you were serving in the hopekids children’s ministry for a while. amen bro, I totally get you. yah, it can be really challenging. but think it’s a very helpful way for us “grown-ups” to ensure that we really understand wat we say we believe in… i rmb some professor (was it einstein?) saying that one has only really understood a super-complex theory if he is able to explain it in ordinary layman’s language. anyway! i’m so excited for ur niece… tk God for your faithfulness bro! Haha, reminds me of what Albert Einstein said. Haha! Continue to learn more about God and walk even closer with Him each day!